This article appeared on pages 30-32 in the August 2006 issue of Native American Review (formally Indian Education Today) published by the Native American Journalists Foundation. It ceased publication in December 2006. As students return to school, some will face writing about "What I did last summer." While such an assignment draws on the writer's personal experience, which is good, what will students learn from doing this assignment? As the curriculum gets increasingly crowded with things to teach, teachers can't afford to have assignments that don't have educational goals. I began thinking again about the goals of school writing assignments when I came across Ann Nolan Clark's little 1969 autobiography Journey to the People while browsing a few weeks ago in a local used bookstore. I knew that Clark had helped write a whole series of books for Indian students in the 1940s, including About the Hen of Wahpeton, Little Herder In Autumn, The Pine Ridge Porcupine, and Young Hunter Of Picuris, some of which were bilingual and printed at Haskell and Phoenix Indian schools. I also knew she had been an Indian school teacher, but nothing else. In Journey to the People Clark writes about how Willard Beatty, Chief of the Indian Office's Branch of Education from 1936 to 1952 and a former president of the Progressive Education Association, encouraged experimenting in teaching approaches and methods. She states that all the Indian-school teachers were using "Experience Reading Charts" where students described their experiences and the teacher wrote them down on chart paper, but her students rather than learning to read from them were memorizing what she wrote and singsonging it back. "But these were charts, and to the children charts were charts and had no connection with books." She even folded paper and bound it with yarn to make booklets, but still her Tesuque Pueblo students did not see these as books and were still against books because they saw books as some sort of white-man's magic closed to them. Of course the Indian Office could not come up with the money to buy her a mimeograph machine to produce something that really looked like books for children, so she had to advance her own money. With a mimeograph machine her "book-hating third-graders with ceremony and pomp were henceforth the Tesuque Printers." They printed and sold thirty copies of A Courier in New Mexico to pay off the mimeograph machine and then printed A Third Grade Home Geography written by Clark, "a book about life every day in Tesuque." Somehow that book made it all the way to New York City where it was published in 1941 by The Viking Press as In My Mother's House and named a Caldecott Honor Book. Her initially reluctant readers went on to Haskell and Sherman Indian Schools and one went on to college and another became an artist. 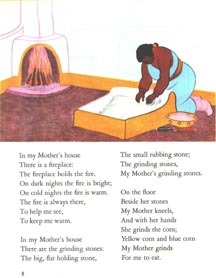 Page 8 of Ann Nolan Clark's Caldecott Honor Book In My Mother's House illustrated by Velino Herrera. In her autobiography, Clark writes, "What a book says must be interesting to the child who reads it or listens to it read to him. The story must be vital to him. He must be able to live it as the pages turn. It must enrich the world he knows and lead him into a wider, larger unfamiliar world. The experience of having known it must have been an adventure and a delight.... A good book has an inner quality that may have a deep, personal, special meaning for some child, somewhere. It is an unfortunate adult who does not remember certain books of his childhood that he will hold forever dear." Unfortunately, the stories in textbooks used to teach reading in elementary schools usually don't live up to Clark's definition of a good book. for children to have books written for them that will help them develop an understanding of themselves, their potentialities and resources, and the pressures and problems of their immediate world. It is the need for books to be written that will help give them an insight into, and an acceptance of, the larger world outside their own. She declares that "books for children should help develop an appreciation of life and all that life means and holds and promises." Clark's book reminded me of T.D. Allen's 1982 book Writing to Create Ourselves published by the University Oklahoma Press, which was based on a 1969 BIA Curriculum Bulletin No. 2 that she wrote with the same title. The ideas in her book are based on her five years experience working with Indian students at the Institute of American Indian Arts in Santa Fe, New Mexico, where she started teaching in 1963, as well as subsequent years spent working with Indian school teachers across the country. She started with her students using their "five doors" (the five senses) to describe something, then had them do short "here and now" exercises that capture the look, feel, smell, sound, and/or taste of a moment in time, and went on to have them write life stories. As the book jacket states, "Allen shows that, by helping a student discover what it is he has to say that is uniquely his own, the student motivates himself to gain language skills and define himself as a person." One of her students, Emerson Blackhorse "Barney" Mitchell, got so carried away writing his life story that it was published as Miracle Hill by the University of Oklahoma Press in 1967. Her students also had their writing commercially published in an Arrow series of anthologies. Allen's ideas to develop young writers parallel those of Mick Fedullo who wrote Light of the Feather about his experiences getting Indian students to write poetry across the western United States. He echoes Allen's advice of students using their five senses to paint a picture in words of the scene or event and let the readers draw their own conclusions. He tells students to not use adjectives like beautiful, bad, cute, good, nice, pretty and ugly that don't really describe anything--"show don't tell." Some of the students he worked with had their poetry commercially published in Rising Voices in 1992. Famous writers like Louisa Mae Alcott who wrote Little Women and Lucy Maud Montgomery who wrote Anne of Green Gables got nowhere with their writing until they took advice to write about what they knew, about the people and places they grew up around. Well known Indian writers like N. Scott Momaday, Virginia Driving Hawk Sneve, Luci Tapahonso and Laura Tohe have built much of their success on the same principle. However, non-fiction or fiction life stories are just one type of writing that students should learn how to do in school. Also useful are five paragraph (or more) essays and various forms of process writing where students brainstorm ideas, write drafts, discuss drafts with fellow students (and the teacher! ), edit, and finally publish in some form their writing. Mike Rose in his book Lives on the Boundary writes about students he met working at the University of California at Los Angeles Tutorial Center that got high grades on their essays in high school and then low ones for writing the same way in college. They had learned to write good summaries of things they read about, but not to critically analyze what they read, which is what their university professors demanded. Daniel McLaughlin in his book When Literacy Empowers writes about a Navajo student who did well in a reservation school and then went to a Harvard summer program where just writing from "the top of her head" was not enough. She was disappointed to learn that she would need to take a remedial writing class, and later wrote to students back at her high school, "Think what you're writing. What are you saying? What is your thesis? Thesis, thesis, thesis: everything has to relate to your main topic." The Applied Literacy Program at her school got students to develop their writing skills in Navajo and English by writing in a variety of ways, including for the school's low-power television station and award winning newspaper. Much of their writing was based on interviewing elders, tribal officials, and other community members. Rose, who was born into poverty and initially did poorly in school, emphasizes again and again how a few of his teachers made all the difference in his life with their encouragement and help. Part of the encouragement and help teachers can give is to provide students some choices about what they read and write about and letting them use their experiential and cultural background to inform that writing. Of course teachers also needs to provide guidance in how this and other types of writing can be improved. Hopi teacher Polingaysi Qoyawayma insisted in her autobiography No Turning Back "on teaching from the known to the unknown." Responding to being told by her supervisors in the 1920s to teach only in English, she wrote, "What do these white-men stories mean to a Hopi child? What is a choo-choo to these little ones who have never seen a train? No! I will not begin with the outside world of which they have no knowledge. I shall begin with the familiar. The everday things. The things of home and family." For Little Red Riding Hood she substituted familiar Hopi legends, songs and stories. Initially reprimanded for her audacity, her talents were recognized by Ho Chunk educator Henry Roe Cloud, the first Indian graduate of Yale University who became Superintendent of Haskell Institute in 1933 and Supervisor of Indian Education for the U.S. Indian Office in 1936. Commissioner of Indian Affairs John Collier also recognized her work and asked her to give workshops for other Indian Office teachers. In all of this, it is important not to forget the role of Library Media Centers that are ideally the heart of a school. Students learn about different kinds of writing by reading different kinds of writing. They develop reading fluency by reading a lot and writing fluency by writing a lot. The availability of interesting reading material in school classrooms and libraries as well as the encouragement by teachers and librarians to make use of that material is critical for the academic success of students. This encouragement should include some time at school for students to read books and other reading material that they select from the library without any pressure to write reports or do other related assignments. Students need a chance to enjoy reading, since it is only when they enjoy reading they will read enough to get the practice they need to become fluent readers. Ironically, the insights gained by Ann Nolan Clark, Polingaysi Qoyawayma, T.D. Allen, Mick Fedullo and many other teachers who have actually worked with Indian students are being lost in the efforts under the No Child Left Behind (NCLB) Act of 2001 to close the achievement gap between American Indian and non-Indian students by using teaching methods based on "scientific" educational studies. Studies that did not focus on American Indian students and ignored the role of motivation in student success! An example of current educational malpractice being enforced under NCLB is the use the Dynamic Indicators of Basic Early Literacy Skills (DIBELS). For all practical purposes, recipients of Department of Education NCLB Reading First Grants are being required to use DIBELS. Author and reading specialists Michael Pressley of Michigan State University noted that its grade 3 level oral reading test only predicted 20% of the variance on more comprehensive reading tests and thus while being quick to administer, it is a very poor measure of students' reading comprehension. Even worse, its oral reading measure is one of "word-calling" (pronouncing words without paying attention to their meaning) rather than comprehension. Indian educators would do well to remember Polingaysi Qoyawayma's focus on students understanding what they read and her demand that "there should be no parrot learning." By ignoring the importance of student motivation and overemphasizing phonics, the Reading First provisions of NCLB are unfortunately moving teachers back towards the "parroting," drill and kill type teaching that Qoyawayma warned against in her 1964 autobiography. Done well, writing about "What I Did on My Summer Vacation" could develop student writing skills in ways similar to the work of T.D. Allen and Mick Fedullo, but it is not just a matter of giving an assignment. For example, students might be asked think about how one or more of their summer experiences helped them grow as a person. In their writing process they could focus on improving a developmentally appropriate aspect of their writing, and ideally their writing should be targeted at an audience beyond their teacher, who could be younger students at their school.